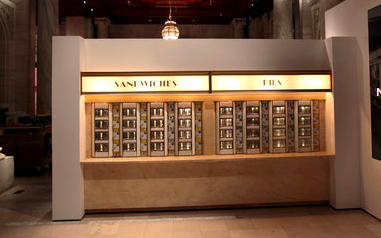 I have always regretted that I was born too late for the joys of the automat. This exhibit at the NY public library would almost make up for it except that NY is not on my travel plans anytime soon (hint, hint work, send me there). I love that you can actually use the vending bit to get recipies. Luckily I don’t have to be in NY to have fun playing with these pictures of old NY. The best part was being able to check out the Google maps image of how things look now.